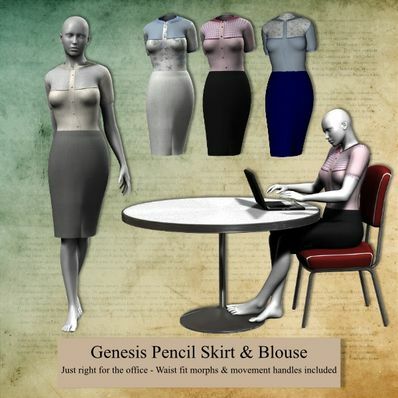 A Pencil Skirt & Blouse for Genesis for use in Daz Studio 4. 4 textures for the blouse and 4 for the skirt. Fit morphs and movement handles included. What a great outfit! Thank you for the fit morphs and movement handles. The duplicate ID error is because it was made in DS4. I have included information regarding a script you can use to stop this. See the readme. Hiya, I seem to still be getting Duplicate ID errors on this one, and the script just says "error processing" on the file. I'll look into it, it's a great blouse, I'd love to figure this one out.